Have you ever wished that you were made of metal? That your bones were as strong as steel and could never be broken, or perhaps that you had your own metal armor? This is a dream shared by many boys but probably few girls. It is an interesting thought and one contemplated by biologists. Not long ago biologists discovered one creature that does have a metal skeleton. It is called the scaly-foot gastropod (Crysomallon squamiferum). 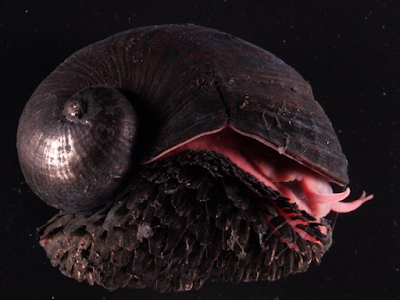 This odd creature is a snail-like animal that lives deep in the ocean near hydrothermal vents where it is warm. They live at depths of 1.5-1.7 miles (2.4-2.8 km). Scaly-foot gastropods grow their own shell which they use as a defense from predators. Researchers have studied metal and other materials as possible substitutes for bone in humans. Metals and other composite materials are used to replace bones in some surgeries such as hip replacements. These materials are in many ways stronger and more resilient than bone. One critical barrier remains to replacing our bones with other materials—self healing. Our bodies are designed to heal injuries using the materials and molecules we had at birth. Our bodies are simply not designed to heal metal bones. Humans may devise a way to replace their bones with stronger materials one day. It may seem better to never have to worry about having a broken bone. But metal bones or armor will not stop all pain or harm. It cannot prevent death. God has given us something better than metal armor. He has provided a shield for us. As it says in the key text, those who trust in God will have him as their protector, as their rock. When we submit to God and trust him to provide our protection then we can have peace. God has outlined his armor for us in Ephesians 6:10-18: righteousness, faith, truth, and salvation. With these tools we have the protection of the Almighty King, much better than any metal. The scaly-foot gastropod can go about its business, without worry of danger, confident in the armor God has provided for it. How much more can we live free from worry, confident in the protection God provides us? Are we not more valuable than a sea snail? Jesus died to redeem us, our salvation is assured. We may suffer broken bones here on this earth, but that is nothing compared to the hope we have in Jesus! If you have had a broken bone, how did it happen? Would you choose between metal bones or metal armor? Why? What do we do when we trust God’s protection but still worry? 1. Yao, Haimin, Ming Dao, Timothy Imholt, Jamie Huang, Kevin Wheeler, Alejandro Bonilla, Subra Suresh, and Christine Ortiz. “Protection Mechanisms of the Iron-Plated Armor of a Deep-Sea Hydrothermal Vent Gastropod.” Proceedings of the National Academy of Sciences 107, no. 3 (January 19, 2010): 987 LP-992. https://doi.org/10.1073/pnas.0912988107. Photo credit: Kentaro Nakamura, Hiromi Watanabe, Junichi Miyazaki, Ken Takai, Shinsuke Kawagucci, Takuro Noguchi, Suguru Nemoto, Tomo-o Watsuji, Takuya Matsuzaki, Takazo Shibuya, Kei Okamura, Masashi Mochizuki, Yuji Orihashi, Tamaki Ura, Akira Asada, Daniel Marie, Meera Koonjul, Manvendra Singh, Girish Beedessee, Mitrasen Bhikajee, Kensaku Tamaki via commons.wikimedia.org. This file is licensed under the Creative Commons Attribution 2.5 Generic license.